Two quick news items. Sadly, despite many of you voting your fingers to the bone, Babylon 5 didn't make it onto the ballot for the People's Choice awards. Thanks to everybody who helped. Let's keep trying to find inventive ways to increase awareness of Babylon 5! Also, those who get the B5 Books newsletter may already know this but B5 Books announced last night that for the month of November they're extending the debut discount period on the gorgeous B5-20 book AND for each B5-20 sold this month, they're donating $10 to #FreeBabylon5. Woo-Hoo!! We are extending the $46 off debut discount of B5-20 for the month of November. For every Babylon 5 at Twenty sold during November, we will donate $10 to #FreeBabylon5. I love the look and I'm proud to be able to point folks to the site now (as opposed to that embarrassing page I originally put up). think i'm gonna rejoin jms news.... very very nice new #freebabylon5 website. All three of the latest ‪#‎FreeBabylon5‬ tee-shirts are now available! Order them to pick up at Space City Con *or* have them shipped! I sent a Feedback email to Ion-TV asking them to air "Babylon 5" in syndication, since they have a contract with Warner Brothers Domestic TV Distribution. I mentioned the #FreeBabylon5 campaign and website. 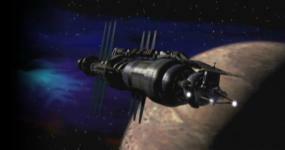 Has Ion-TV ever considered airing the award winning TV series "Babylon 5" (Warner Bros.) in syndication? The Series creator J. Michael Straczynski and #FreeBabyloon5 movement is trying to get back on TV here in the US (It's already back on in the UK.) to expose it to a new audience and hopefully get new Babylon 5 universe projects made. Personally, I'd like to see the "Crusade" (the Babylon 5 spinoff and last good thing made in the Babylon 5 universe) somehow continued. BTW, WINP-TV is the Pittsburgh (with an h) PA market. I'm watching Psych on it right now. Last edited by KoshN; December 17th 13 at 11:36. Hey everyone, I just want to add my voice to the already loud shout of appreciation for Jan's hard work on this campaign. Doesn't she deserve a BIG shout of praise for her continuing commitment to the #FreeBabylon5 campaign? It's not easy to organise all this stuff as well as hold down a normal life ... as well as the expense of funding the campaign mostly out of her own pocket. And I for one wouldn't know how to handle myself in front of many fans at the forthcoming Comic Con. It's about time we thanked Jan and Jenny plus the other campaign front runners for their determination, massive amount of hard work ... and now sleepless nights to add to that ... in keeping this campaign running! Way to go, Jan. We're all with you. Please post here when you've written and mailed your letter! Weekend Sale! http://www.freebabylon5tees.org/ has lowered the price of the #FreeBabylon5 t-shirts still in stock after the Space City con to only $15 until Monday only! Get yours while there's the best selection of sizes and colors available! Remember, proceeds go to benefit Claudia Christian's C Three Foundation. Have you written your letters yet?